Nothing to report here from las Vegas yet, unless you’d like a stream of stories of loss, and if you’re reading the Poker Mutant, hopefully you’re not reading me for that! So far, my first WSOP Deepstack event was my best showing. I’ve played a couple of other of the 2pm Deepstacks and a 10pm Deepstack, one of the nightly 7pm games at the Palazzo, and Limit Omaha Hi-Lo and NLHE at the Golden Nugget. Oh, and WSOP Event #44. Then, last night while I was waiting for my Doubles partner to bust out of a tournament at the Palazzo, I got a little ahead in a NLHE game, got the call that my seat opened in an Omaha Hi-Lo table, and got to play all of two hands before he called and we headed out to dinner at Krung Siam. NP wrote me Monday and mentioned that a friend of his made the money in the bracelet event I played, and while I was looking for his name, I ran across another Oregon player, so as a quick little stats project, I looked up other Oregon cashes and entries. There were 40 entrants who listed Oregon for their home when they signed up. That represented 1.36% of the 2,949 players entered in the tournament. I found 9 players from Oregon who made the money in the results this morning (none of the 40 made it to Day 3). Nearly a quarter of the Oregon entrants—22.5%—made the money. That’s 3% of the cashing field of 297, which may not sound like much, but then Oregon’s population isn’t that big, just 1.2% of the US population, and this is the World Series of Poker. By comparison, Nevada, where lots of poker pros hang out, had 205 entries (7% of entries) for just 0.9% of the population if the US. There were 24 cashes from Nevada; 8% of the cashing field. There were no players from Nevada in the final 16 going into Day 3. It took me a little bit to figure out where my table was Saturday, after blowing out of one satellite early and then getting $100 out of a 3-way chop in a second. I was on one of the tables up on the stage at one end of the main tournament room, once again well out of sight lines to any tournament clocks. In the first twenty minutes, I was dealt 9x9x UTG twice and raised only to encounter horrible flops and laid them down to post-flop action. Between that and other hands I entered—with reasonably playable cards—I was down 800 chips. By forty-five minutes in, I’d managed to win a hand with A♣T♣ and then lose some with the same hand. Then I lost more getting tricky with K♥3♥ and was down to 8,350. If you get 7x7x on BB, what do you get for the flop when you call a raise? AxJx9x. No. Down to 7,900 on the hour. Thought I might make a little back with Q♠9♠ and two queens on the flop. Unfortunately, a jack on the board was the only other hight card, so I lost to QxTx instead of chopping. I saw a flop of 5x4♦2♦ with K♦5♦ and called an all-in who just had Tx4x. He binked a ten on the turn and I was down to just 3,000 chips just eighty minutes into the game. Just before the first break, I was dealt QxQx on BB and shoved over a raise ahead of me. The raiser called and showed a suited ace, but lost the pot and I was left a little more breathing space with 6,700 chips. One of the players from my table in Event #1 was seated on my immediate right at this table, and he was in bad shape. He shoved about fifteen minutes into the second session, and I called him with AxKx. His KxQx made a king-high straight on the flop, putting me in bad shape, but I caught a two-outer with a queen on the turn to make Broadway and zoom up to the stratospheric level of 8,250 chips. Ten minutes later, I was back over the starting stack. About that time, another player from our table busted and another player mentioned that he was Tam Nguyen, the all-time money winner at the Wildhorse Poker Round-Up. Two big pre-glop pots brewed up something good for me. I played K♣J♣ and made two pair against Ax[kx[who][just][paired][the][king,][then][hit][an][ace][on][the][flop][with][my][own][AxKx calling an all-in of 4,700 with another caller. Forty-five minutes after the break, I was up to 22,500 and over the chip average. I raised three calls at 150/30/25 to 1,200 with 8x8x on BTN, got a call, then bet again on the flop and took it down. Then I lost some chips but missed a bullet when the river of a hand where I had Q♠T♠ and a flush draw slowed down the action and revealed my opponent had a king-high flush. I was still over 20,000. As we were getting to fours hours in, I min-raised with KxKx and a short-stacked player shoved. I called him and beat his 9x9x, putting me up to 24,800. Then I blew 6,000 and change calling with A♥8♦ after three diamonds showed on the flop. No more heats ever came. At 250 minutes, I was sitting on 21,575. Then, when QxJx never went anywhere with a flop of AxKxJx, I was broken right back down below starting stack, to 9,975. Back to wolverine mode. I waited until I picked up TxTx about 280 minutes in. There were pre-flop raises to 2,500 and I shoved, getting called by AxQx. That doubled me up to 20,650. Set-mining was getting costly, and I lost 2,400 in two hands calling wit 3x3x and 6x6x. Then I made the mistake of calling a 3,000 bet from BB with J♣8♣. My own experience with over cards against TxTx fared about as well as my earlier opponents’ did. A short stack across the table shoved and I thought he had a low pair. I was right in that my Q♣J♣ were both overs, but nothing came through for me and I was down to just 2,500 at the five hour mark. That was an M (or CSI, if you prefer) of 0.8. The guy who’d doubled up against me and I went into a sort of war just before the dinner break. He shoved, and I called with Ax5x, making two pair against his 6x6x, then I called his all-in with just T♣7♣. He showed AxKx, but not only did I pair the seven, but I made a straight by the river, which cut him back considerably. The glow from a third comeback wasn’t to last long, though. At least, not much longer than the dinner break. About ten minutes into the session, I shipped with AxQx over a 5,000 raise by a player who’d been playing a lot of suited connectors, much to the detriment of other stacks at the table. This time, he had KxKx. I hit a Qx, but never improved beyond that and was out. Six hours and fifteen minutes. ~180th of 478 entries. $95,732 pot. I sat down at the table Sunday and tournament director K from The Final table was the dealer. While it’s always nice to see a familiar face, I have to point out that my track record in tournaments at TFT is not good. For whatever reason, my performance at other venues is far better. Not that I actually believe the dealers have anything to do with it, but if you were the kind of person who did take omens and portents seriously…. Once again, I tok the poison pot. In fact, I took the first two hands with ease. I lost some chips to post-flop bets, but I was holding my own ahead of the starting stack a quarter hour in when a woman who’d been at one of my tables in Event 1 was eliminated on a very loose all-in shove. I was sorry to see all her chips go across the table. To someone else. I picked up a pot with JxJx, even with an ace on the flop, lost 500 with the Mutant Jack against AxQx with nothing on the board higher than a ten. Then I pushed with 8x8x from late position nd won heads-up against the SB with J♦9♦6x on the flop. Half an hour in, I was at 10,450. My first big mistake was calling a 3,000 post-flop raise with a Broadway draw needing a ten. Just after the first hour, I was down to 6,325. I raised UTG with TxTx and got shoved on by a slightly larger stack in BTN. I called him and he flipped TxTx. Nobody flushed and we chopped the 300 chips in blinds. I didn’t even bother to record what my last hand was. All I know is that it was before the break. Tomorrow’s the Limit Omaha Hi-Lo tournament. I hope I do better than I’ve been doing in cash games. In one this afternoon, I was down to 10% of my buy-in, then managed to get up to 160% in almost no time. I should have pushed back and taken my profit, but I almost felt like I owed it to stay in a while longer because I’d hardly been there for twenty minutes. I need to put those types of feelings aside, because I ended up felted after another near-bust, recovery, and bust. Like I told the players at the tournament, I’m a master of the short-stack comeback, but that’s not exactly something you want to have to be good at. Two places in this satellite paid. I managed to lose some chips then come roaring back, really in the thick of it with three left, only to push at the wrong moment and get whacked by the biggest stack who knocked me out of the money. Sixty minutes. 3rd of 10 entries. 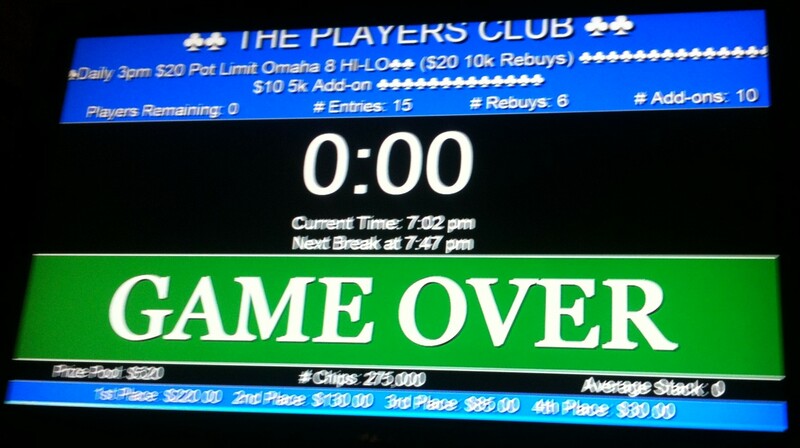 My first-ever losing session playing limit Omaha 8, although it was just a small loss. One of the players I know from the late Deuces who’s now at The Final Table was racking up the chips, and I managed to recover from a couple of early losses to over half again my buy-in, then got snockered down to less than 40% of my original stack. Pulled it out before people adjourned to play the tournament, though, so I was down just half a small blind when I cashed out. Built up steadily through the first session of the tournament, picking up nearly 6,000 chips by the first break. Then a call against a shorter stack cost me more than half my chips, dropping me down to 7,175. I kept looking for whatever edges I could find and managed to climb back up over the starting stack, to 12,525, lost a couple of hands, then picked up 7x7x and managed to get called all-in after I’d hit a middle set on the flop That pushed me back into healthy territory at 18,750. Naturally, when the player I’d doubled against shoved a couple of hands later and I was holding AxKx, I called. He flipped over JxJx and it was a race as far as the flop which had a jack on it. It was nothing you’d even think of calling a race when he made quads on the river. When the third session began at 300/600/75, I was sitting on only 12,200. I called 2,500 with a high-suited ace and got a flop that was uncool, then watched my stack string to 7,200 (only 9 big blinds at 400/800/100). After paying my small blind on that round, I was down to a meagre 5,600 chips. The player in seat 1 was fairly tight, and I went all-in with KxQx following him, hoping for jacks or tens. What he had was AxAx. But the flop put out two more queens, and the river sealed the deal with a king. He got to spin the Wheel of Misfortune. I still only had 10,300 chips, he got off cheap. The blinds came around again, at 600/1,200/150, and I had just 6,300 after paying the small blind. Five big blinds and a couple antes. Then something miraculous happened and I managed to double up twice. Suddenly I was sitting on 45,000 chips. According to the tournament clock (which wasn’t updated as often as you might like) there were 180 players (33% of the original field) left at the dinner break. I had nearly 50,000 chips, about 40% more than the chip average, although one of the players who’d been moved to our table had somewhere in the neighborhood of 100,000. I doubled up again with 8x8x when I shoved on a pot with a bunch of chips in it already call behind me. He had QxQx but one of the players who’d been in the pot and folded said he’d had pocket queens as well. Then the board rolled out quad eights for me. On my next hand I had AxAx and went over the top of a smaller all-in. This time, it was my turn to go to the Wheel, when quad tens rolled out. That was relatively cheap, as well. Certainly, it was much cheaper than the next hand, where I raised with A♠J♠ and called a re-raise from the table leader. I made top pair with a jack on the flop and I should have tried to shut it down right there, but a Kx on the turn and a bad decision cost me another 9,000 when she turned over AxKx. Still, I had 54,000 chips. That didn’t last long though. I lost another 9,700 in a three-way all-in call with KxJx against KxKx. The board needed a queen to make my straight, but instead, I was down to 47,000. Then I lost another big hand with AxJx vs. AxKx. 18,600 chips. I shoved with Ax9x from HJ and took down the blinds and antes to put me up to 23,800. I had 7x4x in SB. There was an extremely short stack in BB. BTN called and I figured I’d see the flop for 1,500. I made bottom two pair on the flop and shoved as first to act. That put me up to 27,400. I had 30,000 at the first break after dinner, once the 100 chips had been raced off. Blinds were headers into the 2,000/4,000/500 range, so I was still in severe territory. Only 90 players were left; we were still forty-odd places away from the money. My last hand was the second after the break, right on the eight o’clock hour. Seat 1 shoved for more than I had. I was hoping he was going with AxKx or something of the sort; I shoved my stack in with 8x8x but he turned over JxJx. This time the over pair held against the eight onslaught. 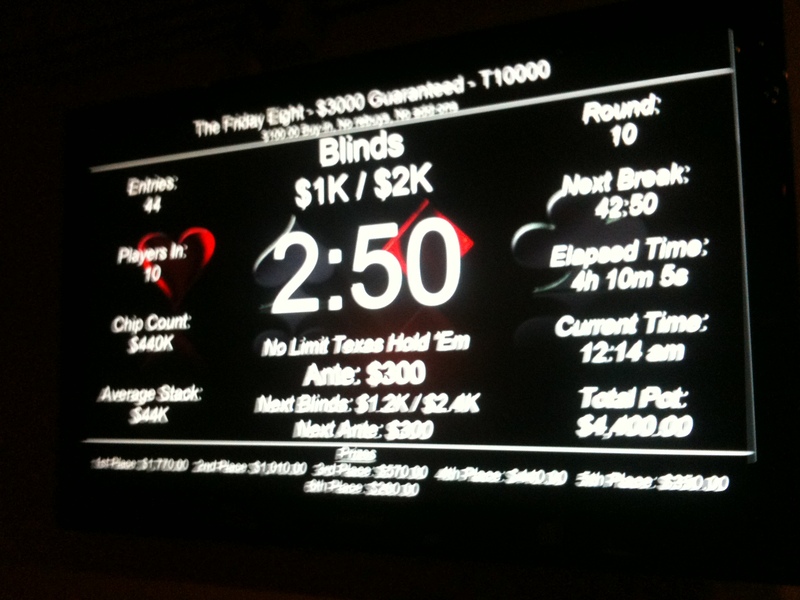 This event wasn’t the biggest buy-in I played in, by far, but it’s the largest live event I’ve played so far. Disappointed not to have made the money—here or in the satellite—but I don’t feel too bad about it. I’ll leave that until after the weekend. Eight hours. ~90th of 548 entries. I made four-of-a-kind with a hand in March at PPC, which got me an extra 1,000 bonus for this game. With the 3,000 pre-add-on, I was starting with 11,000 chips. Picked up a free note-taking tool for my iPhone called MomentDiary which I came to like quite a lot during this tournament. The plan was to try it out at the Poker Pro Challenge but their ban on electronic devices kept me from using it. The great thing about it for poker notation is that it timestamps each entry. Haven’t found a way to batch delete a bunch of notes yet, though; I made more than 75 notes in tournaments on April Fool’s Day. Won the first hand with Jx8x, hitting a straight on the flop. One of the other players said it was the “poison pot” and maybe it was (as you’ll see). Almost immediately after that, I picked up KxKx but was smart enough to lay it down early on a board that was turning into a straight that left me just out of the mix. The winner made quad tens by the river, although it didn’t actually go to showdown. I more than made up for that fold playing 4♠5♠ and hitting a 7-high straight on the flop. I called and pushed on seat 9 and took several thousand chips from him at showdown when all he had was AxAx. My next hand was 4x4x on BTN and I would have bet it but CO discarding accidentally flipped a four over and I just folded instead of hoping the case card would show on the flop to make me a set. That saved me a couple hundred at least; the board was far too high to make a pair of fours happy. Fifteen minutes into the game, I was up about 4,000 chips. I raised to 225 with 6♦3♦, then called a 600 re-raise. After getting an inside straight draw on the flop I bet another 1,000 but had to fold to an all-in bet down the line. Twenty minutes had passed since my last chip count and I was still at 15,125. I raised to 300 with JxTx and made my straight on the river to pick up some more chips to put me at 16,775. Lost a little ground with QxTx after raising to 425 and seeing the board run out 5x5♣7x5x9x. Had to fold to a bet. The Butcher Q♠T♠ messed me over for another 800 when I couldn’t get a king on the board to make Broadway. Holding J♦T♦, I re-raised from 1,200 to 2,500 after a 9♥J♥Q♥ flop but had to fold to an all-in. The winner showed AxA♥ and the original raiser had non heart KxKx. At only about 19% chance to win, my fold was the right thing to do (I was well ahead of the kings) but I sure would have liked to see the rest of the board. I was knocked back to 12,350, but managed to make a bunch on the last hand before the break with JxTx and another flopped straight (queen-high). By the time the counting was over, I was up to 17,350. Starting back up after the break, I saw the flop as BB with 7x3x and had an inside straight draw again. I bet 700 and everyone folded. I folded myself after calling 300 with A♥7♥ and seeing an all-spade flop. About twenty minutes into the second segment of the tournament I was holding 21,800, including the 5,000 add-on from the break. I put out another 1,100 on Ax8x then folded along with several others after a short stack shoved for another 6,000. He showed 6♥T♥ after he raked in his chips. Another JxTx on BTN and I called a raise to 900 along with BB. I had top two pair on a flop with two diamonds. He bet 1,500 and I shoved to take the pot down. Raised to 800 with JxTx just a couple minutes later as HJ and had to fold to all-in from CO, then called 1,400 with KxTx and hit top two pair on the flop. I bet 2,500 and got my opponent to fold. He showed AxQx. My stack was up to 22,650. I was heavily invested in jack-ten combinations in this game and made two pair on the turn just a couple minutes later on a board with a potential Broadway straight on it. Pushing all-in on a 6,000 post-turn bet cost me over 16,000 when the other guy had the straight and I failed to hit a full house on the river. Down to 6,425. Ten minutes later I pushed all-in with JxTx again after pairing the top card on the flop, ran into AxAx and didn’t improve. Two hours and fifteen minutes. -100% ROI. 28th of 41 entries. I don’t get to play nearly enough Omaha tournaments, and I’m a real sucker for the split-pot game. It’s definitely my preferred game over high-only. I’ve had some success with it in live limit cash games and had made the final table in a couple tournaments, but never managed to cash before this game. All I can say is it’s hard to take notes on. Got a 1,000 chip bonus for this game for whatever reason, so I was starting with 11,000 on the table. About ten minutes in, I played AxJx8x5x and made a Broadway straight on the turn with a heart flush draw on the board. A third heart came on the river, there was no low, and I ended up splitting the high with another player holding Broadway. No gain and a little loss from blinds; I was at 10,925 at fifteen minutes. My 5x6x7x8x wrap completed an eight-high straight in a huge pot with two larger stacks all in over me. I took the high by myself, the main and side pot lows got quartered, and there was five minutes of bickering over what amounted to a 300 chip second side pot. At the half-hour mark, I was holding 22,350. I called a raise to 1,100 pre-flop with Q♥7♥5♣A♣, paired the five on the flop and called a bet of 1,025, then folded in the face of another 4-way all-in. Quad eights took the whole shebang. I lost a big hand I didn’t manage to record, and was cut in half to 11,575 near the end of the first hour of play. Then came the hand that changed everything. A♥K♥2♦5♠ looked pretty good on the T♣7♥3♥ flop and by the time 4♥ and 9♥ were also on the board, I had the nut flush for the high hand and a part of the low. With several players all-in (as usual) my stack jumped up to 50,325. Even with the big stack, I added on for another 5,000 chips, one of the best decisions I made in this game, as you’ll see. Just after the break, a Qx6x in my hand made me 5,000 when I improved a full house on a QxQx2x2x6x board. I lost a little ground on a straight draw, but was still at 58,100 one hundred minutes in. The two largest stacks in the tournament were me and another player at my table, and we got into it with both tables five-handed. He pushed hard with a straight and full house draw but I hit quad nines and knocked him out, putting my stack up to 108,400 and more than a third of the chips in play. Knocked out another player with Ax2x4x5x by making two pair for the high and scooping the low, then took a hand from PPC regular T with 5x5xAxKx, putting me up to 118,400. By break 2, I’d hit 140,000. A big pot with 2x2xJxQx made a set to grab the high and put me up to 160,500 as we approached three-hours of play. Then things got grim. In less than ten minutes, I missed two draws for a Broadway straight and a flush that cost me a total of 22,500. Then I made a set of queens on a flop and called an all-in from B, who had KxQx and two pair. Another Kx on the turn made full houses for both of us but I was on the losing side of that one and was back down to 98,500 as we actually hit three hours. Ten minutes later I was still bleeding chips and down to 74,500. I managed to take one hand and bet people off my flush, then lost with two pair against a full house and didn’t hit my low. I hit the same straight as a another player and chopped a pot that would have been nice to take in toto, then flopped another straight and was all-in but was outdrawn by a flush that took all but 6,000 of my chips. It was just twenty-five minutes since I’d had 58% of the chips in play and I was down to one big blind. If I had skipped buying the add-on at the first break, I’d probably have busted out already—at best I would have only had 1,000 chips. The next ten minutes were a blur. I caught some amazing cards, including a couple of high pairs and and managed to double up at least three times. In eight minutes, I was back up to 84,000 chips, then I knocked out B short of the money and hit the last break with 102,000. Not long after the break was over, we managed to get it down to heads-up. I was back on top with about a 40,000 chip advantage but we chopped the top two positions evenly and called the game at four hours. Four hours. +272% ROI. Chopped 2 ways with 15 entries. I called UTG with 9♦3♦ and got a flop of J♦Q♥A♥. BB and I checked it through the 5♥ turn and A♣ river and split the pot with his 9♠4♣. Won a couple more hands with just bets holding king-high. No pots of any real size happened in Hold’em, the biggest was 250 when my pocket nines won. I won a big hand at the beginning of Omaha Hi-Lo, then got rocked back down to 600 chips. I was down to under 400 when I played 6♠8♠4♥J♠ from UTG1 and caught the full house on the 6♣6♦4♠ flop. Q♦ hit on the turn and I bet into it but Q♥ on the river slowed me down a bit with four players going to showdown. I picked up a pot of 630. Lost big with a flopped full house on the next hand when my deuces full of nines were beat on the turn by deuces full of aces, exactly the type of situation I’d been concerned about in previously. The river 5♥ actually gave me two beaten full houses because I had a five, as well. I was down to 277 chips but still active with 4♦J♣2♣3♦ in the BB. A player was all-in for 60 and there was a call ahead of me. The flop was 2♦8♦5♠, I bet , the other caller folded, and the all-in player flipped A♣6♠5♣J♠. I had a nearly 50% chance of scooping the pot, and I did when the 6♥ came on the river. Not exactly a big win, though. Razz was my downfall. I ended up mostly all-in with 6♣4♣A♠6♥7♣ but got high cards on sixth and seventh streets. A deuce would have tied me with the winner, but he had two of them. Seventeen minutes, 33 hands. 2,476th of 2,546 entries. Really can’t remember this one. It was the last of the +$200 for first place games I could make in the year, I re-bought but didn’t add on because I had a bunch of chips, then I busted out not long after the break. Ninety minutes. -100% ROI. 40th of 43 players. Got into the PLO8 game a little late but did reasonably well, including my usual variant stack. Made it to the final table and got into a couple of hands with C, winning one big pot but eventually losing it all well before the money. Two hours and forty minutes. -100% ROI. 9th of 27 players. I’d had reasonable results at Foxwoods playing Omaha Hi-Lo, and I figured if I could do well there, I should be able to do okay at the new Oak Tree Casino in Woodland. I wasn’t disappointed. Sitting in the game for an hour I picked up a tidy profit and moved on to my next task for the day. One hour. +29 big blinds. Action was tough and I did not last long beyond the re-buy period end, but I did manage to snag one of the bounties, the only player not in the money to do so. Ninety minutes. 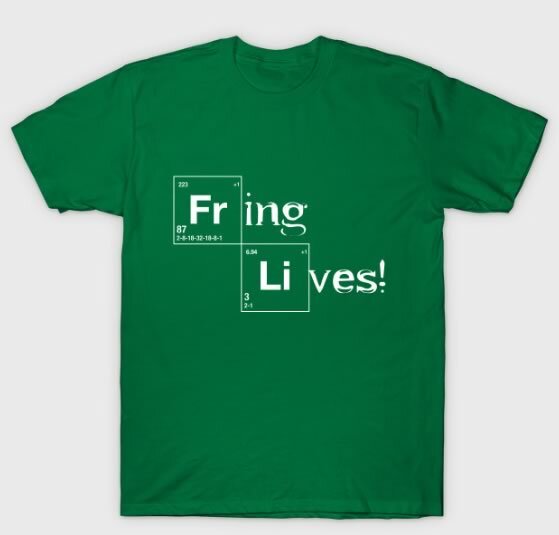 -67% ROI. 8th of 9 players. There were seven names on the board for Omaha, but they weren’t opening up a table. Finally, I sat down at a Hold’em table and proceeded to prove to myself how much more I like tournament Hold’em over cash games. Two hours. -33 big blinds. Really, I shouldn’t have even been playing this tournament. My plan was to check in on the size and head to Oak Tree if it was small (which it was) or at the very least wait until the $1,000 guarantee game at 8pm. My failing for playing games I don’t get to play often took hold, though, so I signed up and ended up being the first man permanently out (after a rebuy). Forty-five minutes. -100% ROI. 8th of 8 players. Was doing pretty well then made an extremely bad call with the bottom end of four cards to eight-high straight on the board. My opponent had nines, of course, and I lost 80% of my stack. Eventually, I called an all-in with A♠Q♠ and the guy I’d called said “Good luck, sir” before flipping his AxKx, then conceitedly told the rest of the table at length as I walked away that the ace-queen was the “parking lot hand.” I didn’t bother to tell him that he was—even with his dominating hand—only 7:3 against. I knew my chances. Wandered back up to Woodland to see if I could recoup some of the day’s losses. At first, it looked like I’d just be adding to them—at one point I was down to only about 40% of my original buy-in—but I got back in the game and started pulling in pots, particularly from one player who I think thought he’d had me pegged as a fish in the beginning. I may be a fish, but some of us have small, sharp teeth. Two hours. +37 big blinds. Things started off on the wrong foot when Carbon’s client didn’t respond to my click for a call fromUTG with 5♦Q♦ and sat me out. I would have made top and bottom pair on the flop and beaten the ace-high that won the hand. Made it up a bit on the next hand by hitting Broadway from T♦J♦, then lost my winnings when my two pair was beat by a better two pair. A river 5♠ gave a full house to a player in the second hand of Omaha Hi-Lo, knocking me down below half the starting stack. I pulled back a little on the next hand with 2♦3♦T♠A♣, making two pair with the ace and deuce for a chop of the high hand and taking all of the low because I had the trey. My “garbage hand” 3♦2♠9♥7♦ not only gave me the low on the next hand but it made a ten-high straight, beating the eight-high of my opponent. I won parts of the next several pots and by the time we hit Razz, I was back up over 1,200 chips. I won one pot in Razz, but I’d crashed back to 680 chips by the time Stud began. A set of threes (with one hidden) pushed me back into contention for a bit, but a full house in Stud Hi-Lo brought me down. Thirty minutes, 40 hands. 1,802nd of 2,955 entries. Played three tournaments yesterday(ish), which brings my total since 1 May to 98, including both live and online games. Twenty minutes. Didn’t even bother to check the entries or my position but I think I was first out among about 45 players although some likely showed up after I was KOd. -100% ROI. I thought of variations on the theme of what I should have said as I drove across town to the Encore. I still had enough in my pocket for a buy-in in their Friday night 8pm freezeout, and I even managed to get a spot in their parking lot. Sometime about three months ago I stopped keeping notes on my live games. It seemed distracting, I wasn’t always finding time to post the results here (I’ve got several games from June and July I never got around to), and I felt I wasn’t able to concentrate on my game as much. On the other hand, I was cashing more often while I was keeping notes, so I decided to do it again for this game. Did it make a difference? Early on I lost 1,300 chips with Q♥J♦. I needed a 9x for a queen-high straight but folded on the turn bet and the other two players still in the hand chopped my contribution, as they were both holding AxTx and made a pair of tens. Hit a pair of queens with Qx9x and took a small pot, then tossed JxTx post-flop which would have made a jack-high straight on the turn. By 15 minutes into the game I was down to 8,600 chips. J♣7♣ lost me 250 when I folded after an unpromising flop. I pushed 1,200 into the pot holding 9x9x in position after a limper who called but Ax on the flop and a bet from the limper made me throw it and he showed his Ax. Down to 7,575 at 33 minutes. Called a raise to 425 with Qx8♣ but tossed it after another ungood flop. Three-quarters of an hour in, I was down to 6,950. Finally, my flushing strategy worked with T♠8♠. I hit on the turn and pulled in enough to bring me back up over starting level, to 11,825. Overbet AxTx and lost 1,200 when I didn’t connect by the river heads-up and my opponent bet another 1,200. At the first break I was holding just over the starting stack: 10,125 chips; just a little below average with only one player out. I went card-dead for quite a while and slipped slowly to 9,100 after the return to play, then shoved from BB with JxJx (the strong hand of the night) and was called by AxQx (which was consistently losing last night). The woman who called me had me covered by only about 600 chips and the loss was crippling. On the other hand, I was up to 17,800 by the two-hour mark. I called an all-in with A♥8♥ and was outmatched by A♦9♦ but the board gave me a low straight and I knocked out a player, taking me up to 23,200 at 2:15 into the game. By break two that had increased to 25,800. With the blinds at 400/800/100 after the chip-up, I raised to 2,000 with QxJx from UTG and managed to take the blinds down. With K♥5♥, I raised from BTN to 2,400. There weren’t any hearts on the flop and BB won the pot hitting jacks over nines right off the bat. A player with 9x9x went all-in with 14,000 and I called with KxKx, which held up. A little more than three hours into the game, I was up to 33,800. I promptly slammed down again calling an all-in from a 5,000 chip short stack with JxTx. They tripled up. Clubs failed me again with A♣5♣ on BB. There weren’t any black cards on the board by the turn when another player bet out and I folded, losing 1,600 chips. Twenty minutes after being at neatly 34K I was down to 24,600. Another twenty minutes had me cut down to 20,600, just under the average stack. Two kings on the board by the turn forced me to fold Ax8x and forfeit 1,600 more chips. The slide continued, down to 18,800 at the third break. Four hours into the game and it was an even 14,000. I took the blinds and antes with K♦[tyd] but a pre-flop all-in with QxTx got called by a big stack with AxJx. I had an up-and-down straight draw from the flop, but nothing else materialized and I was gone. Five hours. Finished eleventh of 44 entries. Six places paid, with $4,400 in the prize pool. What better to cleanse the palate of five hours of play, only to bust out short of the money, than some mixed-game online action? I joined the game with only four other players at one of two tables, playing Pot Limit Hold’em. I lost a couple of early pots, laid down a K♦J♠ after missing the flop that would have cleaned up on the fifth hand, then finally turned A♣8♣ into enough to get me back up over starting stack on hand 8. The very next hand, I paired my ace in A♥7♠ on the flop to win a small pot, then lost a little back. We lost a player on hand 10, then the tables consolidated on hand 14. 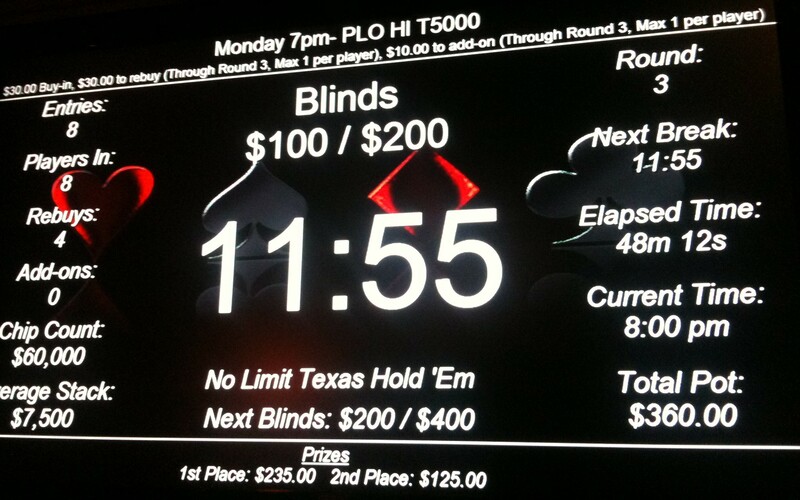 The sixteenth hand was the beginning of our switch to Pot Limit Omaha Hi-Lo. Hand 21 was a turning point. I picked up K♠9♥3♥2♦. Seemingly not a particularly good hand, but with low possibilities if there’s an ace on the board. I raised to 90 (from 15/30) UTG, was re-raised by UTG3 to 315, and called after BTN called. The 7♥J♦K♥ flop gave me a heart draw and top pair; I bet the pot: 990. UTG3 went all-in and I was all-in to call. He had 7♠A♠K♦A♥ for two pair as it stood; we were 40/60 with me on the short end. But I made the flush on the 5♥ turn and his only hope was to catch7♣, 7♦, or K♣ on the river. I went from 2,295 to 4,920 and a more than 1,000 chip lead. I didn’t win anything through the next round of PLHE, actually managing to lose the 1,000 margin I’d had. By the start of hand 40 I was down to 3,285. That hand, I got 3♦4♦A♥7♣ in SB and called the 60 chips of the big blind. The Q♦T♥3♥ flop gave me a gut-shot Broadway draw; I had a backdoor nut flush. I checked it and BB checked. K♣ on the turn gave me the nuts: Broadway. I checked, BB bet 225, I pot-raised to 1,425 and he called. A pointless 7♣ showed on the river. I checked, BB tossed in his remaining 515 chips and I called. He just had kings and threes. He was KOd, I was up to 5,945. Hitting trip nines on the next hand (the last of that round of Omaha) put me over 6,000 chips. A♠Q♠ on hand 47 dragged in another nearly 4,000 chips. 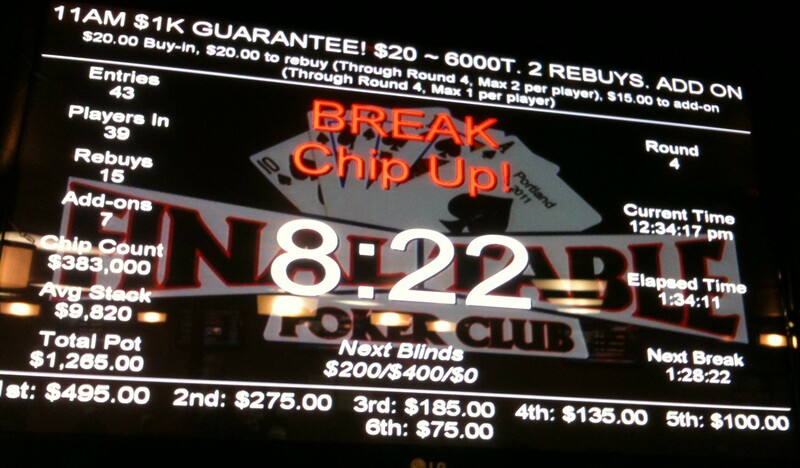 At nearly 8,500 chips, my nearest competitor was 2K below me. I lost a bit on a few hands, but a split high pot (2♦2♠K♦K♣ on the board and two of us with aces) on hand 54 (PLHE) got me up to 8,088. My nearest competitor and I went head-to-head in hand 56 (PLO8) with me taking the low and earning a couple hundred in early bets and calls. The next hand, I picked up 6♣6♦K♦A♣ in HJ at 75/150. Action folded to me, I raised to 450 and got called by BTN and SB. The flop of 9♠5♦2♣ missed me completely and got checked all around. 2♠ on the turn didn’t do me any good, either, but when SB checked to me I bet 750 and both the others folded. I was up to 9,288 and I was invincible with a nearly 3,000 chip lead. I lost 825 speculating with one of those unrecommended hand that I nevertheless enjoy in PLO8: 9♣T♣7♦8♥. SO good if you manage to hit a bunch of mid-range cards on the flop for a straight, not so good when it’s 5♥5♣J♦ and someone bets 1,330. I folded and watched nothing that would have improved my hand show up. I speculated with a couple of more hands, dropping down to just over 6,000 chips by hand 63. Then I picked up 5♦2♠A♥7♦ and everything went to hell. 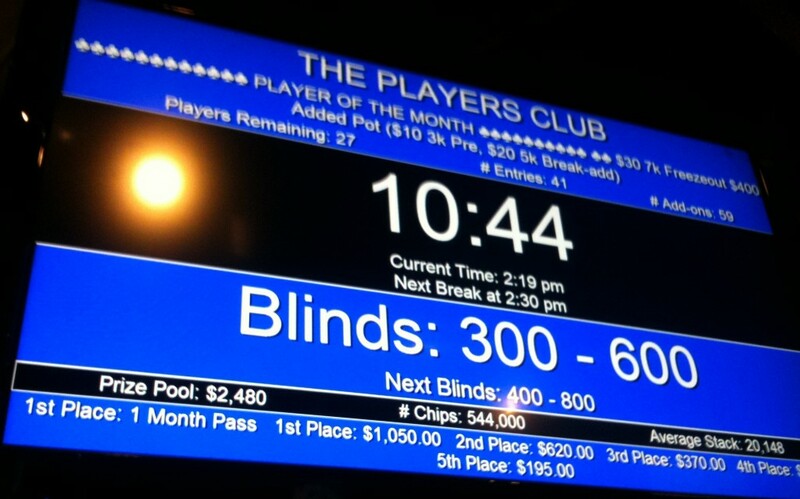 A player starting with just under 5,000 raised to 425 from UTG1, and I re-raised to 850 for some reason. 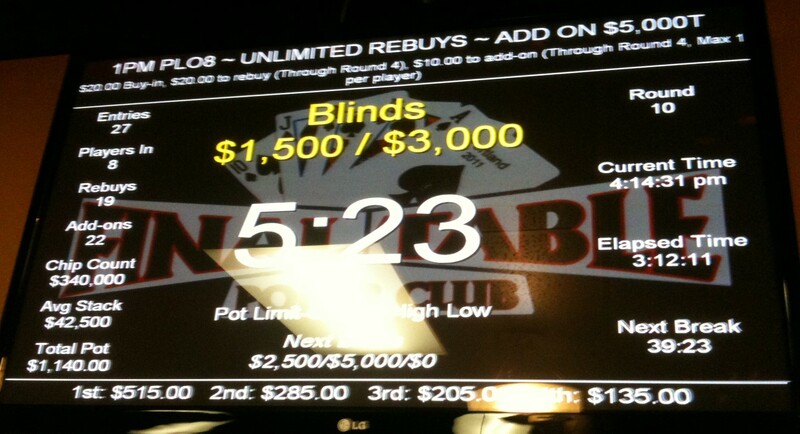 SB folded, BB called, then UTG1 raised to 3,475. My hand wasn’t strong—even if a low came along I could be easily counterfeited— but I called anyway. The K♦K♠8♦ on the flop gave me nothing, but I still called an all-in bet of 1,450. My opponent flipped over A♠A♦6♥4♠ for a pretty good two pair. The K♥ on the turn sealed my fate. With no possibility of a low and a full house in his hand, I was drawing dead for a pot of 10,775 chips. I started the first hand of a round of PLHE with just 1,101. My last hand (at 100/200), I potted pre-flop from UTG to 700 with J♥T♠. BTN re-raised to 1,200, then BB pushed to 4,400. I called with my remaining 401 chips and BTN folded. BB flipped over K♠A♥. He had over cards and both my suits, but I still had about a 35% chance. That dwindled to 22% when we both paired on the T♦9♠A♣ flop. Neither the turn or river cards improved my lot, and my implosion was complete. Top to bottom in five hands. 67 minutes. 67 hands. Finished seventh of 10 players. Three places paid; $190 prize pool. This would have been a good time. The Carbon Poker/Merge client has an optional readout of your made hand—or what your hand would be if you hadn’t folded it. I folded this hand pre-flop, looked down for a second, and when I looked back after the river card, saw it told me I would have had a seven-high straight flush that beat the king-high flush which won the pot. And I would have tied for the low. I didn’t manage to capture a screen shot of the hand in play, but here’s the history. Quite the turnaround from the weekend tournament. Three hours of mixed games essentially wiped out the cash game profits from the other night. I won two hands, one of them because D convinced everyone to evaluate a Badugi hand incorrectly and the other only marginally because I split the low of an Omaha pot with Ax2x3x4x5x. Down 2.5 buy-ins. Since it was close by, I stopped by The Final Table to see if they had enough people for their advertised 11pm turbo but there were just a couple tables playing. 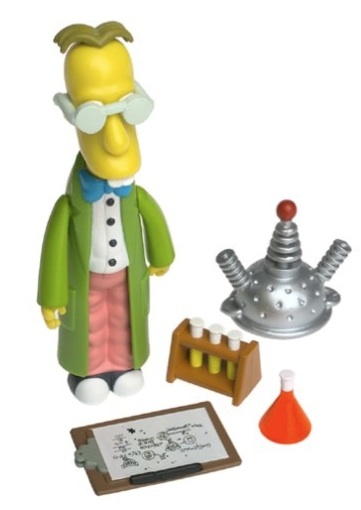 Ran into one of the dealers I’d originally met at PPC who was managing the place and who actually remembered the card cover I’ve often used, which is the helmet from my Simpsons®-brand Professor Frink figurine. Another every other week, another mixture of wacky games. Lost one re-buy almost immediately in a huge Omaha pot. Ended up down for the night.